Baking the quantities needed for large families requires good sized containers and powerful motors. Often these can only be found with commercial food mixers used in restaurants, however, the Kitchen Genie Bowl Mixer with its 5 Litre stainless steel mixing bowl and powerful 1000 Watt motor will easily handle all your large quantity baking and mixing tasks. The five-litre capacity stainless steel mixing bowl means you can whip up a dozen eggs at a time or make a hell of a lot of cake batter – almost 3kg of it, enough for two or three cakes. 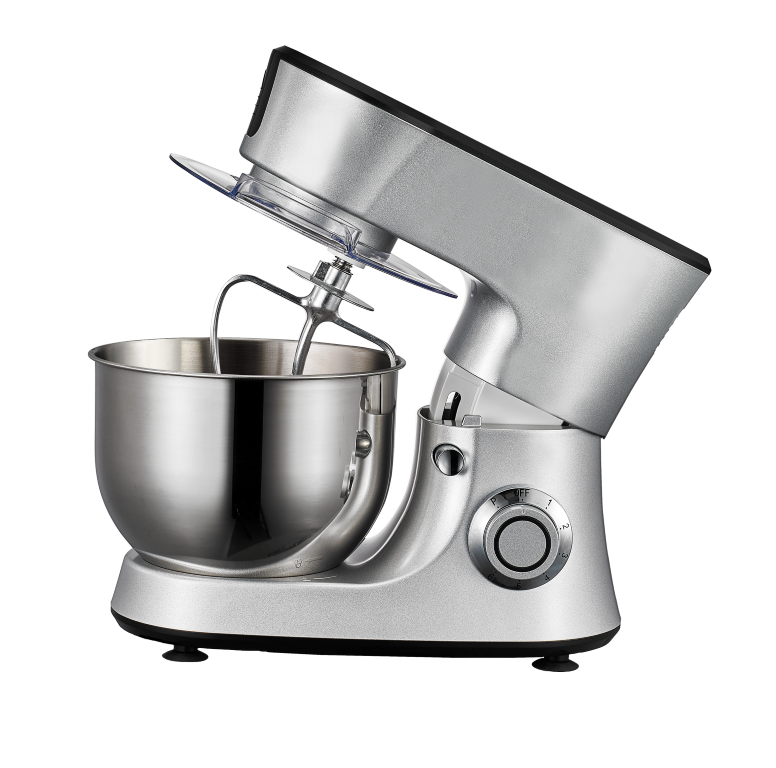 The six speed settings, a powerful 1000 Watt motor with robust design, means this stand mixer sits firmly on your work top and is sturdy and stable, even when mixing large quantities at high speeds. Whilst the splash guard/cover minimises splashing and mess. When you’re adding ingredients in stages the tilt head design allows you to check the mix and add or remove the bowl easily. Aside from the high quality plastic housing which it sturdy and easy to wipe down the bowl and attachments ( dough hook, beater and balloon whisk) are all made of stainless steel, making them durable, hygienic, and easy to clean , even in a dishwasher. As food stand mixers go if you need something approaching a professional level bowl mixer you can’t beat (for give the pun) the Kitchen Genie 1000W Bowl Mixer. 6 SPEED SETTINGS – choose the setting best suited to your recipe. TILT HEAD DESIGN – easily add ingredients, check progress and add or remove the bowl thanks to tilting head. ACCESSORIES – stainless steel dough hook, beater and balloon whisk, essential for baking bread, cakes or making desserts etc.